Disclaimer: The statistics were recorded but not with the ensuing timeline as to when plays and touchdowns were scored. 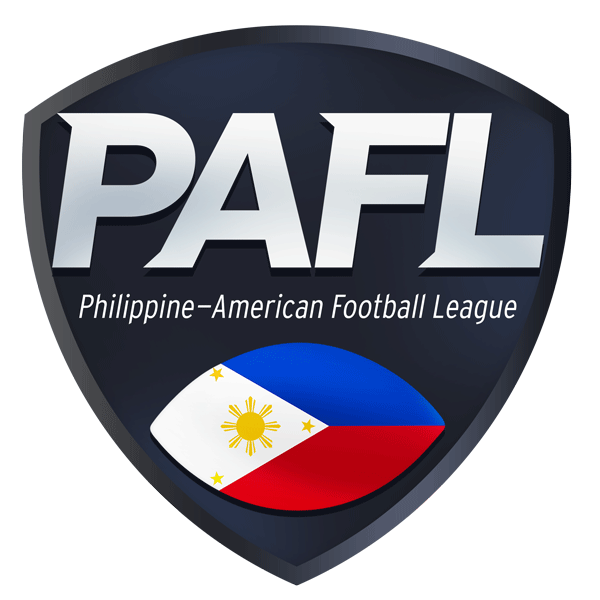 Going into their 2nd games of season 3, the Olongapo Warriors look to upset last year’s runner up the Cavemen. 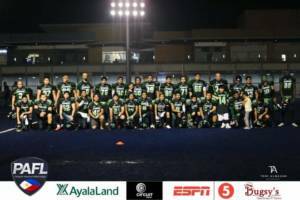 Donning new jerseys of black and green reminiscent of the Seattle Seahawks colors as opposed to their original blue and white uniforms from the last two seasons, they appeared quite ready to take the challenge as kick off ensued. 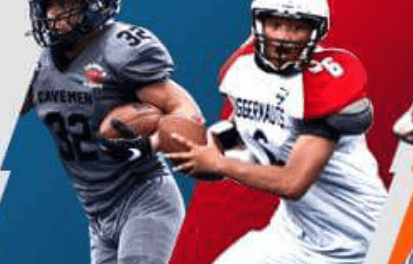 The Cavemen on the other hand are looking to claim their second win after beating the Juggernauts last week as they looked hungrier than ever. As expected, both teams looked to find their rhythm during the first quarter as they went scoreless in the first ten minutes of play. This was then interrupted by the Cavemen’s first Touchdown care of a 7 yard run by Running Back Mikey Reyes. 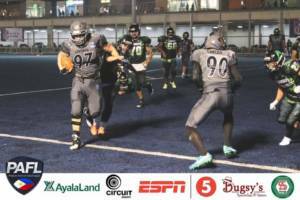 This was then followed by touchdowns coming from RJ Laurel and Maximo Carlos respectively who would also score 6 more points for the Cavemen in lieu of three 2-point conversions for the night. 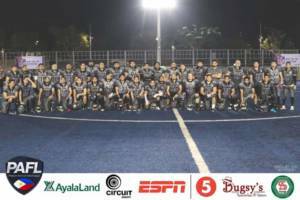 As the afternoon gave way to the brilliant lights over the Chelsea Blue Pitch, the Cavemen would once again score a touchdown just before the first half ended care of linebacker King Cunanan who would score due to a forced fumble by the Warriors’ offense. 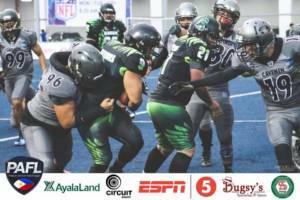 It looked like the Cavemen, running on full steam would make easy prey of the Warriors as they looked to shut down their opponents in this much heated rivalry. 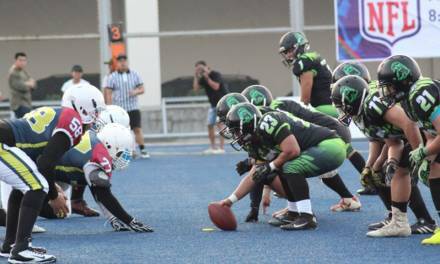 After halftime, the Cavemen looked poised to to take over the game and hand the Warriors their 2nd scoreless outing in just the first two games in the PAFL season. 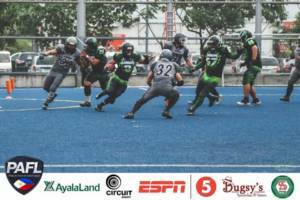 The third quarter was a different story as the Warriors rallied behind their defense as they held the Cavemen back from scoring at will. Several penalties on the Cavemen offense due to holding violations brought the ball back towards their own red zone which was then highlighted by a sack by Warriors defensive lineman Jeff Deperio. 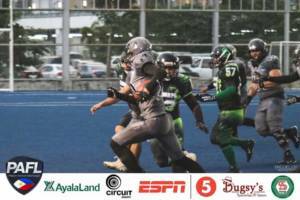 After getting the ball back several plays later, the Warriors would catch the Cavemen defense off guard through a brilliant 60 yard run by speedy running back Joel Catayong who made sure that a shutout was out of the question. They then put up a field goal putting up their score to 7. 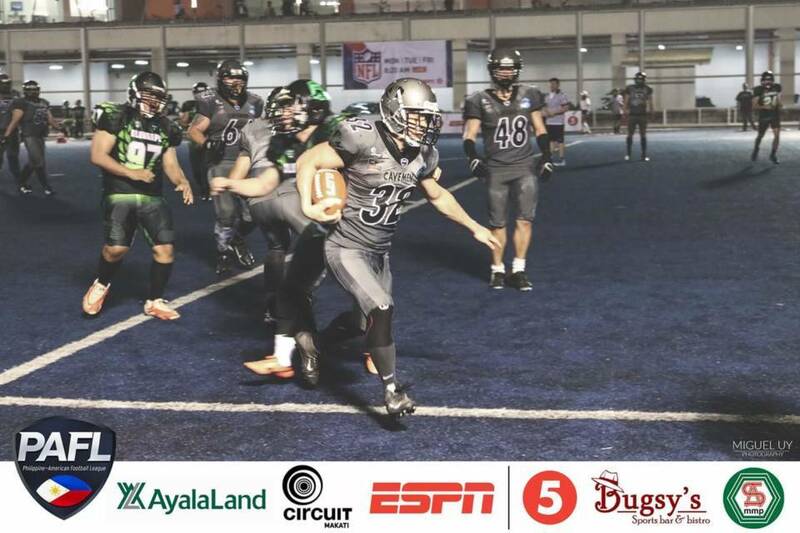 Still trailing, the Warriors’ defense though never let up as a forced fumble by Jeff Solivas led to a defensive touchdown by linebacker Steve Caps heralding a possible comeback as the team’s “Never Say Die” attitude was beginning to show. Frustrated over the Warriors’ momentary run, the Cavemen brought out all the stops in the fourth quarter as they relentlessly went downfield by running the ball through the tough black and green defense resulting into two more touchdowns by team Captain Will Yeh and wide receiver RJ Laurel who managed to slip out of several tackles on a brilliant run to the end zone surprising the Warriors’ defense with his quick feet and fast paced dukes. Looking to seal the win, the Cavemen went to their go to option in the presence of season 1 rookie of the year Maximo Carlos who managed several amazing catches resulting into another touchdown for the Cavemen. 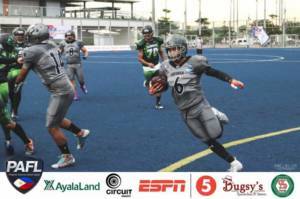 Incidentally, Maximo “The Ultimo Avenger” would become player of the game as he also recorded two highlight reel worthy interceptions for the grey and black squad. 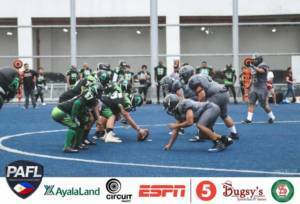 The Cavemen, assured of their victory in their tenacious fourth quarter battle didn’t let up one bit as they put probably the biggest exclamation point and possible play of the year when scoring the last of their 2 point conversions. They went to their BIG man; defensive lineman JP “The Legend” Suarez who after being handed the ball by QB Mike “Sunshine” Hoese, hesitated a little, then ran to the right which such forceful determination he even laughed at the face of a Warrior linebacker before handing over a stiff arm that put him on the ground. The Legend then strolled into the end zone expressing his delight with the same hype and energy he is best known for, causing the Cavemen bench to empty and erupt in cheers. A tough game overall with a valiant effort from the Warriors going against the unyielding Cavemen spirit ended with a score of 50-13, with the Cavemen coming out on top. The Cavemen now set their sights on the newest team in the league, the Rebels while the Warriors look to rally as they take on a tough Juggernauts team on Sept. 29 at the Chelsea Blue Pitch. 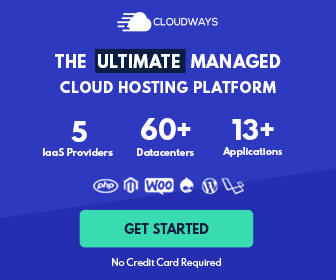 CATCH THE GAMES! BRING EVRRYONE ALONG as it promises to be yet another spectacular day of football!